Note: These remarks were originally prepared for National School Choice Week, but the event was unfortunately snowed out in Vermont. We’re to celebrate National School Choice Week and all the gains that have been made across the nation – which have been substantial – allowing families to access the educational opportunities that they know to be best for their children. But, more importantly, at least from our perspective, is the chance to celebrate Vermont’s 150 year history of school choice, which I believe is the most comprehensive and dynamic in the nation – for the too few who have it. Our current system has consistently left behind our most vulnerable students – those from low income backgrounds and those with special needs. Now, we don’t have school choice in my town, so we had to pay the tuition to get my son into the right learning environment for him. This was possible only because my family could afford it. But for other kids in his class in the same situation, this might not be an option. This isn’t fair. But we don’t make the system fair… just… practical…. or successful by denying kids opportunities, we make it fair by empowering all students with the resources to access a more diverse menu of opportunities. School choice breaks down the barriers of arbitrary school district lines – these glass walls defined by zip codes – by empowering all parents with the resources they need to either find the right school for their children, or, in some cases, like with many of the cases here in the room today, start their own schools if the right school can’t be found. This is right. This is just. And this works! Thank you all for coming today and sharing your inspirational stories. 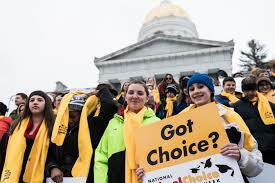 Your school choice is something special. Appreciate it. Protect it. And most importantly, do your best to make sure every child in our state has the chance to experience and benefit from it as you have. It’s not only the practical thing to do, it is the moral thing to do.